Allen Graves: Did he say what he said he said? There was a bit of a brouhaha in the comments the other day, and it had to do with the controversial remarks of a Sierra Madre resident named Allen Graves. The issue being whether or not he had taken a stand against a moratorium on development at last Tuesday evening's City Council meeting. A well-spoken gentleman in a distinctly lawyerish (lawyerbetic?) kind of way, which is what he actually is (link), Mr. Graves left many here with the impression that he had strongly encouraged the City Council to delay implementing both of the two water related building moratorium measures. At least for now. I think. Instead engaging in a kind of process that would take into account things like the money that would somehow be lost if we didn't build hulking massive blocks of McMansions at Mater Dolorosa, One Carter (or whatever they are calling that sadly abused place these days), and Stone House. Something Allen claimed would cause the loss of city employees that we might actually need someday. Which was an interesting observation in itself. Trading Sierra Madre's last remaining open spaces for more City Hall employees being problematic for some. There are other tangential issues that concerned Mr. Graves as well, all of which he apparently believes would be reason enough to delay the imposing of moratoriums designed to prevent the further abuse of our last and precious water resources, along with what remaining options are left to us. Here is how Attorney Allen Graves depicted his Tuesday evening remarks in the comments he left here on The Tattler Thursday. He was responding to some of the criticism he had been taking on this blog, much of it in reaction to the mention he'd received in the Pasadena Star News that day (link). The questions of his "anonymous" inquisitor are included here as well for context. Hi everyone. Allen Graves here. A friend told me I should look at this blog. Not sure why she said that – it hasn’t been fun at all. First, I strongly support the moratorium. I am shocked that the Sierra Madre codes do so little to require water conservation in new buildings or to support it in existing buildings. Putting the brakes on issuing permits until we can come up with a rational system was clearly the right thing to do. Second, I am concerned that we have done nothing to make a financial plan to support the moratorium. Despite what you may have read here, we really will lose permit revenue because of this. I have no idea how much, but I’m worried mostly because we use that money to pay staff, and we will need staff to implement and enforce better, more restrictive rules. I never thought we should reject the moratorium because of the cost, I just said that we should figure out what the cost is and make a plan to ensure that we can still effectively make and enforce limits on development with our smaller income. Nothing would make big developers happier than to see us lay off the staff who inspect and regulate existing building sites because we didn’t have a plan to deal with the lost revenue. Third, I think we all need to get ready to push our City Council hard to make real improvements to our codes. This moratorium is a victory for all of us, but it won’t last forever. We need to act fast to develop and implement rules that will stop massive houses on unsustainable hillsides, recognize our limited capacity for growth and favor infill and adaptive reuse in the limited space we do have. So no, I’m not a fan of big development and I don’t for a moment want to see us sell out our amazing town. I do believe that my city should balance its checkbook just like I do. I want my City Council to watch the pennies and know how much every vote costs. Protecting this town is worth spending money on. I just wanted to know how much we are spending and make a plan to use our limited resources to make real changes that will stop destructive hillside development and promote a sustainable town for all of us in the future. Is that how you think you came off at the meeting? At the meeting? Sure. I spent most of my time talking about the need to quickly implement stronger limits on water use and development. In a newspaper that was looking to create the appearance of some opposition and conflict where very little actually existed? Not so much. You do realize that new housing starts in Sierra Madre are minimal, and that is really the only thing that would be affected by the moratoriums that were put into place on Tuesday, right? In a built out town new water hook ups would obviously be minimal. Lot splitting might bring a few. What is substantially more imperiling to employee security in Sierra Madre would be the sunsetting of the UUT. The question of those employees you felt that we might still need was raised by those supporting Measure UUT. A majority of the voters apparently didn't care that much. I suspect the same voters would not believe demolishing our last remaining open areas in order to save those jobs would be a good trade off, either. I don't know how many of these permits we issue in an average year. I wish that had been covered at the City Council meeting. I completely agree that the lost fee revenue is NOT a reason to allow more development. It is a reason to make a plan so that we keep playing the bills. One concern is that the money from the fees might be specifically earmarked for staff wages so even though it is not much money it could be disruptive if not dealt with ahead of time. So I think we agree about smart controls on development, I just want to maintain fiscal responsibility at the same time. Protecting our town and watching our budget are not conflicting goals. We just need to get all the numbers on the table and make sure we have money in the right places to control development without waiting your tax dollars. So what was your take on Measure UUT? I do think our city needs to be fiscally sound in order to protect ourselves from damaging development. As I understand it, One Carter got where it is today at least in part because the city could not afford to keep fighting the lawsuit over that project. There will be lawsuits from the moratorium we just passed as well, and we need to be responsible with our finances in part to make sure we can defend the moratorium in court. Ignoring the fiscal impacts of our policy decisions is no less dangerous than ignoring the drought. These developers play hardball. We now have a City Council that will stand up to them, but they need a sound financial house to that. And we do also need our city staff. The moratorium is an opportunity, not a solution onto itself. We need to seize the opportunity and make permanent rules that protect our city. We need our city employees to help at every phase of that rulemaking. If we can get the City Council to appoint a committee that will act quickly and firmly, it is the staff that will study, report, and help draft the rules that will keep our hillsides safe. Two years will go by before you know it, and the rains may come even before that. We must work together to install the rules and policies that we need before the moratorium expires. So yes, I will speak up for city employees, city finances, and anything else that we need to turn our great ideas into actual rules that protect our town. I promise a long line of out-of-town developers at the permit window on the next rainy day. We need to be ready. What was your take on Measure UUT? Thank you again for the kind comments. There is now at least a small chance that my wife will let me attend another city council meeting. With regard to Measure UTT I don’t have a position because I have not learned enough about the issue. I did a lot of research on the moratorium before I decided to support it. (And before I expressed the concerns that have caused so much comment here.) I haven’t done my homework on the UTT yet so I will withhold judgment until I can develop an opinion based on facts. In general I love my city and I believe that its fair to ask people like me to pay my fair share. But I am concerned that the money be spent well (I think it is often wasted), and I’m concerned that the burden of taxes be borne by people who can afford it. I’m really hesitant to tax people who are just getting by in order to fund a government that is overpaying for nearly everything. So where do I stand? I don’t know. I have an old-fashioned desire to know actual facts before I open my mouth. I guess that would make me a pretty lousy politician hunh? How do I get to the video tape? Scroll to the bottom of the post. Click on the box. No box on my apple iPad at the end of the post. Works fine on my MacBook. My guess is Graves was for Measure UUT and he is afraid to admit it. How could he not know about the biggest issue in last April's election, yet know all about the Moratoriums? His arguments against the moratoriums are much the same as the Measure UUT arguments. You overestimate the information level of the average Sierra Madrean. It is possible that he only knew about the one issue that night, even likely. The majority of the population here doesn't even know the council passed the moratoriums. Sorry 8:00 but he's a pro-UUT guy all the way. I'd love to know if he contributed any money to any of the pro-UUT candidates. I think Allen Graves is full of do do. No where in his later comments does he acknowledge that if the City Council would have listened to him, there would not be any moratoriums. After all the passion of people who came to that meeting on Tuesday night, filled the chambers to over-flowing, and stayed for a very long time, the fact is that if the City Council had listened to Allen Graves, we would have ended up eventually with some "plan" to see how much revenue Sierra Madre would be losing from building permit fees that could adverely impact on the salaries of city employees. That's the reality Mr. Gaves. 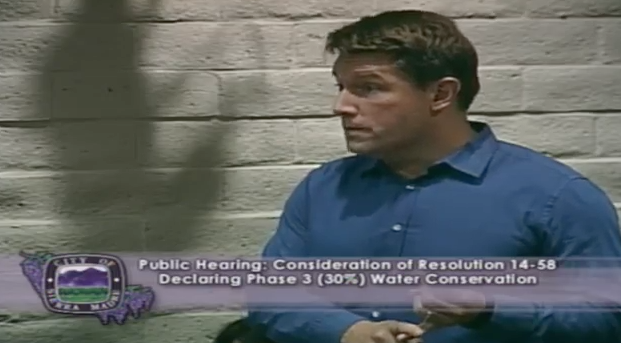 You sought to take the air out of one of the most important meetings in Sierra Madre's history by your comments. Finally, you appeared to be more concerned with the loss of development fees and their impact on employee salaries than the loss of open space and how more McMansions leave less water for all the rest of us during one of the worst droughts in California's history. For that, every resident in Sierra Madre is entitled to be angry with what you did at that City Council meeting no matter how hard you try to walk those comments back. I think you've said it all 6:48. No matter how hard Mr. Graves may try, he can't deny the import of his remarks. He should just come clean and say he blew it on Tuesday night. That is, if he feels he did. Or he should come right out and say that Tuesday night he was trying as hard as he could to convince the City Council not to pass the Moratoriums. I'm going to say tbis. Let's take Allen Graves at this word (his most recent word) and put him in the pro-moratorium, pro-not letting continued development strain our scarce resources, and pro-putting Sierra Madre on a sustainable path. Let's see what he does going forward. Let's see if he's as passionate about this cause as Mary Ann or Barry Gold or Heather. That will be the ultimate test of whether he is telling the truth or not. Until then, I am willing to give him the benefit of the doubt. graves is a lawyer. he speaks on both sides of a topic, uses lots and lots of words and yet he doesn't really say anything of note. I think he's trying to say that the city needs to find that happy medium between the proper amount of employees to do the work and the proper amount of income to pa for that work. good luck with that, mr. graves. I can't think of anybody who didn't have a position on the UUT. All of what he was concerned about show him as a strong Pro-UUT proponent. He should have just admitted that. Instead he did what lawyers will do. That's where the guy loses all credibility in my eyes. How can you not know anything about taxes? I know lots of people who didn't know about the UUT. I helped with one campaign and talked with hundreds of citizens and only a handful were concerned about the UUT. Most were surprised that they were being taxed 10% on all utility bills. When asked if he had any concerns, one man said yes, the fire engine sirens were too loud. That is all he could think of. He didn't know about the UUT. Don't think for a minute that our village is well informed. Projecting your bias on Mr Graves because he is a lawyer does a disservice to all of us trying to inform and educate the public. Graves is a buddy of John Hutt, another lawyer. I don't believe him that he didn't know much about the UUT. Graves says in his posted comments that he wanted a speedy enactment of a moratorium, yet in the video he thinks there should be a staff report first. Something our city manager would drag out for months. Graves is full of hogwash. Allen Graves just needs to come clean. He was one of maybe three people who tried to stop those Moratoriums from being passed. The other two were Mr. Love and that lawyer for the CETT. You can judge people by the company they keep. Every other speaker expressed concerns about how, during this time of one of the worst droughts in California's history with the residents being asked to tighten their belts and let their lawns die off, we would want to allow the building of more McMansions to deplete our already scarce resources. Mr. Graves instead was more concerned about how the loss of revenue from building permits would impact on employee salaries. Quite frankly, his concerns were a little lower on my priority list. Mr. "Allen Graves here", needs to admit that he had taken a position on the UUT. It goes towards his credibility. He doesn't want to admit it becaue he simply doesn't want to undermine his arguments any further in favor of some stupid "plan" to figure out the amount of revenue that would be lost by denying the issuance of building permits. Listen, alot of people were in favor of the UUT and that's fine. Just don't insult my intelligence by saying that you don't know where you stand on the UUT because you have "an old fashioned desire to gather actual facts before I open my mouth." You already violated that rule at Tuesday night's meeting. Graves made his position worse by taking the bait and answering the UUT question and not telling the truth. The idea that he doesn't have a position on the UUT after all the concerns he expressed on Tuesday night and on this blog about the supposed loss of revenues from building permits that we never had in the first place. What makes it even worse for him is that while alot of people in this town were in favor of the UUT, I would suspect that alot fewer people of those same people would be less in favor of a revenue source that sacrificed our water supply, open space and sustainability in the process. He's a Plaintiff's lawyer for employees. Where do you think he stands? Maybe this was all just a sales pitch for at risk city employee business. I can never underestimate the ability of the Tattler to get to the bottom of things and bring the truth out so I have to ask: Can the Tattler get ahold of Allen Grave's ballot to see how he voted on the UUT? Even though I think we all know how he voted, I just thought I'd ask. That would be illegal. And wildly offensive. Produce the ballot and then let the readers' decide. Have s sense of humor 8:03. Whatever happened to the notion of a secret ballot? Sure you can eaily check to see if someone voted in an election, but how they voted? Only in a voice vote in Congress... or if you review old videos of the City Council... but in a balloted election? This is America buddy and some things remain true to the founding principles. Jeeze! I was just kidding 8:46. I was actually making the point that the Tattler is pretty amazing with some of the things they are able to come up with. But producing the secret ballot that Mr. Graves submitted, may be even too much for the Tattler....although you never know. Allen Graves was against the moratorium before he was for it and he was in favor of the UUT before he doesn't have a position on it. Maybe he has short term memory challenges, 7:19. "Trading Sierra Madre's last remaining open spaces for more City Hall employees being problematic for some." So if we fire some city hall employees we won't have McMansions? Awesome! Big lawyer speak with forked tongue. I'll trade Elaine for not having 10 McMansions. Danny Castro is worth about 5. "I think we can all agree that…"
No matter how Allen Graves wants to wiggle and waffle, he strode up to that podium with a purpose. He wanted to use whatever lawyerly skills he had to pursuade the City Council not to vote in favor of the Moratoriums. That was his goal. Now he tried to make his arguments a little more palatable to the crowd because he knew he would be an outright pariah in the community if he was too overt in his comments. So he tried to make himself appear to be kind of in favor of the moratoriums and kind of against development, but he knows and we know what he was trying to do. The reason we know it is because if the City Council would have listened to him, the Moritoriums would not have passed. Allen seems to be back-peddling as fast as he can. He wants to everybody's friend. Kind of like Mosca. Or Goss. Graves was talked into this. And whoever did him that disservice did not fill him in on all the necessary details. Like the one about not talking to The Tattler. Yea, somebody placed a call and he was put up to this. Then he allowed someone on the Tattler to take his deposition and dug himself a deeper hole. what did SM do so wrong that we got such an iflux of wannabees? Mr. Graves, Did you vote in the April election for City council members and on the UUT ballot measure? If yes, why did you not do your due diligence on the UUT before you voted, and if you did not vote, why not? when did you move into town, Mr. Graves? Mr. Graves is a progressive. He did not do his due diligence. Salaries and benefits for many employees in this city are way out of line. He seems to be a typical lawyer. He has a right to his opinion and as such, he should stand by it. He doesn't need to try and tell us what he really meant. We already know. I suspect this may not be the last time we hear from Allen Graves in Sierra Madre's politics. We'll probably have more opportunities to see his true positions more clearly in the future. We'll have to see how much he in in favor of preserving Sierra Madre from over-development and putting Sierra Madre on a sustainable path now and for the future. His credibility is pretty much shot as far as I am concerned. my only exception would be Kurt Zimmerman, who was actually a real attorney who only got involved because of the blatant corruption that was going on with regards to the direction of the city. Is Graves the newah Green? More pictures the better! Party!!! Isn't Allen Graves a former minion of the same lawyering cabal that the pipsqueak Harabedian belongs to? Is there some connection here? I don't trust him even though his written sentiments sound oh, so very convincing... We'll see much more of Graves prior to his 2016 debut as a candidate I'm afraid. fortunately, he's already looked foolish and everything stays available on the internet. It must be grim being a judge and having to listen to guys like this all day. No wonder they carry hammers. lawyers like Graves don't frequent the courtroom, like Buchanan, Mosca and Harbedian. Allen Graves' voting records show he moved here in 2009, voting in our 2010 election, didn't vote in 2012 and voted last April. He didn't even vote in the 2008 presidential election. He is Noah Green II...a mouthy lawyer who shows up and attempts to put the spotlight on himself with nonsensical statements based on the belief that we are all idiots who "haven't considered all the implications" of battles we have been fighting for more than a decade. His arguments are completely incoherent. We shouldn't stop development because it might cause us to lose development fees with are basically designed to reimburse us for the cost of development. Ummmm Allen...if there is no development then there are no costs that need reimbursing. How is it that you can tell who voted and when? has Sierra Madre become a refuge for the dregs of the law profession? WHY - IS CITY HALL IS DESPERERTALY AFRAID OF A FORRENISIC AUDIT! I think that many residents living in the community has missed the issues! 2) city hall has been living outside its means for years! 3) city hall has miss appropriated water & sewer funds for years! City Hall has No Money in its water & sewer department to make water & sewer in fracture improvements for the people who live in this community! 3-b) city hall continues to spend water & sewer income to pay for city expenses and staff which we do not need! I feel that the residents can clearly show city hall how are monies should be spent more efficiently! a) AND QUIT BORROWING MORE LONG TERM DEBT! b) QUITING GEETING INVOLVED IN MULTIPL LAWSUITS! LONG TERM DEBT & INCREASED CITY EXPENSIVES MAKES THE CITY "POOR" and the MONEY LENDERS RICH! Sorry Mr. Caps, you need to get your facts straight except for one thing. Your statement about long term debt and increased city expenses is right on. One way in which the city could save a lot of money, is to get all employee's (of which we have too many of) health benefits that don't cost a bloody fortune. I see the amount of money being paid for these health plans, and do not understand why the heck they are so expensive. We have over 200 employee's with excellent health insurance plans, dental, eyes, etc. The same as these city employee's yet we don't pay that much for it. Not even close. The city could save a bundle if they just had reasonable health insurance costs. I seriously don't understand why the cost for just this is so much. they need to shop around. They could save more then 50%, most likely even more if they just took the time to do some searching. I have never seen these prices for health insurance, never. With the exception of our Government, of course. As I have pondered Mr. Graves, much more than I want, I figure he may have won his agenda: that being a future run for council with the support and the money from the employees union. heather? Are you out there. Save his comments for future reference when Mr. Graves is running for office. Yes, when you turn in the recall papers and he can be on the ballot to replace the current Council members. Dear Moderator, could it be possible to make the comment box larger? thank you for your 110% support!!! 9:35 I've found that you can keep typing and the comment box will expand automatically, or you can pull it to a bigger size by dragging the lower right hand corner. But then the publish button will disappear and after you finish your long comment, you need to drag the box to a more closed position for the button to reappear. Hope that helps! Allen "Noah" Graves states "With regard to Measure UTT I don’t have a position because I have not learned enough about the issue. I did a lot of research on the moratorium before I decided to support it. (And before I expressed the concerns that have caused so much comment here.) I haven’t done my homework on the UTT yet so I will withhold judgment until I can develop an opinion based on facts." Voting records show that Allen Graves and his wife both voted last April in the UUT election. And yet he wants us to believe that he doesn't have "a position" on a ballot measure he just voted for or against three months ago. Yeah ok Allen. So who sent the obviously politically ambitious Allen Graves to the slaughter? and here here is the big news tattlers. ALLEN GRAVES LIVES ACROSS THE STREET FROM JOHN BUCHANAN. Graves speaks like a typical lawyer. Actually Graves lives at 60 E Grandview and Buchanan lives at 65 W Grandview....still only 400 feet apart. John Buchanan practices employment law for Edison. Allen Graves sues on behalf of employees. They have to know each other. Maybe Grand View needs a Redevelopment Zone. You have to wonder why hardly any of the pro-development crowd was willing to speak up at that meeting. Or why, if they supported preserving Sierra Madre and its resources and putting us on a sustainable path, they would'nt speak up in support of the moratorirums. Either way, they look awfully bad. I think maybe the other crowd wasn't willing to get up there and tell the crowd they are against the moratoriums so they made a few phone calls and founds some willing dupes to do their diirly work. Fortunately, it failed spectacularly..
13. The other number of the beast. Developers struck out last night, but they went down swinging. Three sluggers went to the plate to argue against water and building moratoriums in Sierra Madre. -- Water Board Rep Love tried to convince the Council that our water glass is half full. Council Member Arizmendi reminded him the town needs more than half a glass of chloramine to survive. --Resident Allen Graves tried to say that sure, development sux, but we need more than a Wisteria Vine to run this village. We need a plan, we need fees, we need... Allen Graves! To help us dumb townies figure this out! --McMansion lawyer Ronald McDonald sent in a pinch hitter to deliver many letters of the alphabet including EIR and CEQA. The crowd said BOO. So that's the ball game. Three up, three down. There's bound to be a rematch for sure. Just as sure as dirt and water make mud. I came to the CC to support the three proposed ordinances and as I was walking in, I saw a friend who I had not seen at a council meeting before. She came to support the building moratorium. When I saw her the next day I asked how she liked the meeting. She said she was surprised at some of the speakers who were rude and unruly. She thought some of the majority opinion members of the audience did not respect the speakers for the other side or the council members and said she wanted to hear what they had to say, even though they were not going to change her mind. She said because she was close to the front, she felt uncomfortable at the feeling in the room. Will she come back any time soon? I don't know but we should think about how we conduct ourselves to make sure we don't make enemies out of friends. I think everybody was very respectful 12:41. People felt strongly about this issue and clapped for certain speakers. Tom Love received no boos and whistles only respectful silence even though he really attempted some pernicious things. Allen Graves even received some applause but certainly no boos or hissing. The only speaker who eliciited derisive laughter was the lawyer for CETT who made the silly comment about there not being a water shortage. It was funny and deserved a laugh. So your friend's comment is patently untrue. If that person feels uncomfortable about the passion that one side exhibited that's their problem. There were some big issues being discussed at the meeting that affected every resident in Sierra Madre. Town saving can be dirty work. The timid and easily offended might just want to wait for the Mountain Views News to come out for their news. It is guaranteed safe for those who need it. Was not implying the crowd was inappropriate. Faced with threats and provocation, they were polite and respectful. Good people. I can't believe somebody is trying to smear the good people who came out and stood up for their community Tuesday evening. That is very sad. That was the most respectful big crowd that I've ever seen at a meeting with this much at stake. The town is under assualt from alot of different directions. All they want to do is say leave us alone and put us on a sustainable path so that we don't have to rely on others for our very survival. Is that too much too ask? With so much at stake, I was actually surprised by the courtesy that was shown to the speakers who opposed the moratoriums including that nice kid who wanted to build the family home. The City council should make a finding that the 3 ordinances it passed were categorically exempt from CEQA just to be safe. I was surprised not to see such a finding in the ordinances and immediately suspected sabotage on the part of city staff/city attorney. Wondered how long it would take a Tattler to see sabotage on the part of city staff. But then, some of the Tattlers see sabotage in everything the city staff does. There are good reasons for that. uh-huh, sure. We can always find a conspiracy somewhere in City Hall if we use our imaginations enough. I hear they're after our tax money in order to get themselves $37,000 a year health plans. Hey 11:47, City Staff and their public employee unions have destroyed many a city. Because of their quest for things like retiring at 50 with huge pensions and always seeking higher salaries and benefits, its understandable that the citizens are wary. The public employee unions often work at cross-purposes to the people who pay their salaries. So cut the informed readers of the Tattler some slack who know about this issue which makes them understanably suspicious of certain people's motives. Why wouldn't former Mayor Walsh take a stand on one of the most important issues facing Sierra Madre in years. I mean, say something, anything. But to remain silent - the silence is deafening. These kinds of issues show us who cares about this town. It would even be better if they joined Love, Graves and the CETT Lawyer and spoke up against the moritoriums. But to remain silent, tells us all we need to know. I'm busy too. But I took the time away from my family to go down to City Hall and participate in the debate. Where were they? The only former Mayors who spoke up were Clem and Mary Ann. That says alot about them. Its also more reason why we need to elect the right people to the City Council. I wish Clem and Mary Ann would run again. You don't get any finer people in Sierra Madre than them. That's our best right there. I would vote for them, and contribute to their campaign. Mary Ann too! In his protest letter, the One Carter attorney makes a big deal about the failure to comply with CEQA and the failure to prepare an EIR. The council needs to make a finding that the ordinances it passed are categorically exempt. Someone should ask the city attorney why that language, which is standard boilerplate, wasn't included in the resolutions to pass the ordinances. I just don't understand why he was in such a tizzy. Stonegate/Carter has water meters. He is just trying to build a case for suing. It is the only way they'll get any money out of that miserable mess. If that CEQA language needs to be added, it can be easily done I suppose. It's boilerplate. This is just another delaying tactic. They're desperate to stop this, and they hoped the old process dodge would help them. Nobody listened. Okay, I watched the video, read Graves statement. I believe I'm sick to death of the phrase fair share and it should be banned from the mouths of all Government officials! Who decides whats a "fair share"? I'm tired of paying my own fair share, and paying a lot of others peoples "fair share"! From Federal, State, and local taxes, fee's fines, etc. I AM paying my fair share, while others get free housing, food, phones, dope (in Washington State, OMG) I'm so tired of that phrase, "fair share". What it actually means is a few pay the bill for a whole bunch who pay nothing. IMHO It's never a fair share. I'm tired of working so darn hard to be told I need to pay my share. They won't be happy till everyone is living hand to mouth. So, again, who decides what each persons fair share is Mr. Graves? I'm with you 1:06. I'm tired to death of paying my "fair share" (which seems to increase everyday) especially while other folks are out scamming the system to avoid paying their "fair share". I recently had a workman at my house who wanted to be paid in cash because he was collecting unemployment and didn't want the income to be reflected on his "award" of benefits. tough. I wrote him a check. Now he can pay his "fair share" on that money. Going overboard much. The guy is for the moratorium and wants fiscal discipline at city hall. He was wrong to say that the vote should be postponed, but he is right that it is unacceptable for staff to claim in a report that they had weeks to prepare on one of the most important issues facing the town that the financial impacts are unknowable. It would take less than an hour of oh so valuable staff time to total the permits of the type prevented by the moratorium from the last two years and the fees collected on them. Um, no. The reason Graves called for City Staff to do a report is so that it would delay the two moratorium measures. This is an old trick out of the Doyle-Buchanan phony baloney handbook of process delays. The people of Sierra Madre demanded these moratoriums be passed, and the 5 members of the City Council heard it loud and clear. You want a report, you do it. Otherwise get out of the way, the City of Sierra Madre has real work to do. Go drag your feet somewheres else. They just never give up. These folks know the power of "delay". Allen Graves knows it too. Everybody was there, everybody was energized and very passionate about the moratoriums. The opponents of the moratoriums know it gets difficult to keep arousing the people for these meetings. People are busy, people have families to take care of. I saw one woman who brought her little girl holding a stuffed animal. How many meetings is she able to come to? You can say all the right things as Allen Graves says now, but to have tried to delay the vote is a powerful weapon and he knew it. It always worked so well in the past. They were probably stunned to find it just wouldn't save their bacon this time. Instead they're being laughed out of town. Graves has put himself in the category of Green and Buchanan and a few others, we are polite to them at the coffee shop but are thinking, "what a doofus"
that's what lawyers do - they delay - push around paperwork - delay some more - talk alot and delay some more. Please. There was an obviously coodinated attempt to derail the moratoriums beginning with the laughably dishonest Tom Love (who works for cities and developers) and John Buchanan's neighbor Allen Graves and the One Carter attorney. The contract for water with the MWD says their water (which is 100% of our water now) can NOT be used for growth or development. Approving any development is a breach of that contract and could lead to a cutoff of our water. Tom Love didn't mention that little nugget but Harabedian did. Tom Love and Alllen Graves...you are traitors to our community. oh year, I'm a lawyer and I'm smarter than you, don't think so....well let me tell you..."blah blah blah blah"
one of Grave's problem is apparently he was getting his "facts" from his neighbor John Buchanan and we all know that "facts"are played loose with the utlity company lawyer. Grave's might not be aware that Buchanan and the other utility company lawyer Mosca called emergency meetings and declared city emergencies that began the UUT and it turned out to be a complete sham and was actually used to push securing matching federal funds so Buchanan could gleefully build us wasteful new 7 million dollar library. Flat out lied to us and was hiding that his mentor Doyle had squandered millions of city money on a water shell game and the UUT was actually about water bonds, not our infrastructure collapsing as Buchanan claimed. She should. For his own good. I'm sure there are chores he could be doing. Ask Graves about his plans to build many apartments on the already developed small lot he owns in the heart of our city. That's right. Graves cares about himself.